JACKSON HEIGHTS, New York (CNN) -- Every day, unemployed men gather under the elevated 7 train in Jackson Heights, Queens. Many of them are homeless. All of them are hungry. Jorge Munoz estimates he has served more than 70,000 free meals since 2004. At around 9:30 each night, relief comes in the form of Jorge Munoz's white pickup truck, filled with hot food, coffee and hot chocolate. 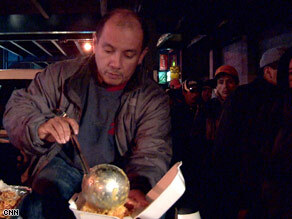 The men eagerly accept containers of chicken and rice from Munoz, devouring the food on the spot. Quiet gratitude radiates from the crowd. "I thank God for touching that man's heart," says Eduardo, one of the regulars. Word of his mobile soup kitchen has spread, and people of all backgrounds and status now join the largely-Hispanic crowd surrounding his truck -- Egyptians, Chinese, Ethiopians, South Asians, white and black Americans and a British man who lost his job. "I'll help anyone who needs to eat. Just line up," Munoz says. And at a time when food banks are struggling to keep up with skyrocketing demand, he's never been needed more. But for Munoz, a school bus driver by day, this work is a labor of love. "When I see these guys on the street," he says, "it's like seeing me, 20-something years ago when I came to this country." "She said this was a better future for us," he says. On Saturdays he takes the men breakfast, and on Sundays -- his "day off" -- he brings them ham-and-cheese sandwiches. It's a relentless schedule, but either Munoz or his sister does it every night of the year. "If I don't go, I'm going to feel bad," he says. "I know they're going to be waiting for me." With the economic downturn, donations have slowed as the crowds awaiting Munoz's arrival have grown. But he is determined to do all he can to meet their needs. Munoz estimates that food and gas cost approximately $400 to 450 a week; he and his family are funding the operation through their savings and his weekly $700 paycheck. Asked why he spends so much time to help people he doesn't know, he answers, "I have a stable job, my mom, my family, a house... everything I want, I have. And these guys [don't]. So I just think, 'OK, I have the food.' At least for today they're going to have a meal to eat."